For the sake of brevity, I'll ignore the other comments you made, despite my disagreement with them. I do not have ill will towards cyclists. I know cyclists. I occasionally ride a bike myself, though I don't consider myself a die-hard cyclist. I think it's a great way to enjoy nature. I'm just pointing out that cycling can have an impact on the landscape. Cycling on an old forestry road or gravel track is one thing. Cycling on an unimproved foot trail, especially during the wet season, requires a whole different set of considerations. Rochester has multi-use trails, which aren't exclusively built for bikes, normally made up of gravel and or pavement. VT, which was an example you brought up earlier, has an extensive network of backcountry roads, which are also used and maintained by vehicle. The ADK's does have some active and inactive forestry roads that would be suitable for bike traffic. Intensive use of any area in the ADK's requires maintenance and upkeep. The snowmobilers figured this out and organized into clubs which take an active role in maintaining their trail networks. They also spend a lot of money in towns that would otherwise be dormant over the winter. If you want more bike access, organize, advocate and build political and financial support for your cause. The world isn't out to get you. If you want something, go work for it. I'll be attending a sportsman's meeting with DEC R5 personnel next week and I'm sure Boreas Ponds is on the agenda. The main parking lot for hikers, campers, backpackers, and cyclists would be located at the site of the current interim lot about 3.6 miles from the dam at the Boreas Ponds. So most of the people exploring the Boreas Ponds will park at this lot. It sounds like ADK and some others green group leaders have talked with DEC already about the UMP. I just don't know how, without staff, they could manage letting paddlers drive in but not others. A permit is one thing, but a key to a gate is another. I'm looking forward to the meeting with DEC next week. Rochester has multi-use trails, which aren't exclusively built for bikes, normally made up of gravel and or pavement. Please show me which of these multi-use trails is gravel or pavement. Again, I don't think you really know what you are talking about in regards to off-road biking, so let's leave it at that. I'd encourage you to get out to any of the places listed on that site and walk around and see what they look like. As far as how this affects Boreas Ponds, we are far off topic here, and my only interest is whether or not the road will remain open to snowmobiles and motor vehicles. I have a slight interest in if the state will allow an exception of mountain bikes in a Wilderness area, but by no means would I ever advocate bikes riding on current hiking trails. Even most snowmobile trails and some old roads are not very suitable. I believe I said that already. I’ll admit that I enjoyed a fun mountain bike ride from Blue Ridge Rd to the dam at Boreas Ponds in the summer of ‘16, after calling the DEC to make sure that it wasn’t illegal to do so, and before they publicly announced that it was ok. I even recorded a video of the adventure but never shared it publicly simply because I favored a “Wilderness” classification. The only semi-negative encounter that I witnessed was during a different trip later in the year when a group of bikers got a bit annoyed by our group with backpacks & canoe carts taking a short break while waiting up for the rest of our group to catch up before continuing up the gentle hill ahead of us (mentioned earlier in this thread). It all happened really quickly and we tried to get out of their way as quick as possible, and no one was intentionally trying to make the other group unhappy, but it happened. 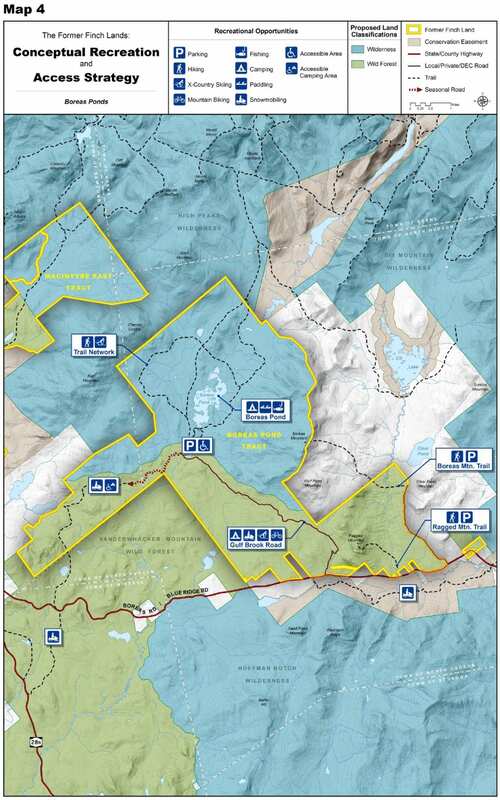 I love to ride my mountain bike, and I love to hike & paddle also, but it seems clear to me that’s these activities may possibly (& accidentally) cause similar conflicts along the road to Boreas Ponds again in the future. Last edited by Justin; 02-06-2018 at 08:16 PM.. I'd say if bikers, hikers and canoeists can't share a 12' wide road, then we have a long way to go as a society. Maybe anecdotal, but I always bring up Fish Pond TT, and always will as a what I see as a good use of an old forest road. It seems to be shared well by all users, and there are no shortage of bikers using it or folks carting canoes. It's also nearly as long as Blue Ridge Rd from the main highway. It's an extremely popular ski trail in the winter, and I'm sure Blue Ridge Rd would be if snowmobiles were not allowed. It's an extremely popular ski trail in the winter, and I'm sure Blue Ridge Rd would be if snowmobiles were not allowed. One of the main reasons for the Wild Forest Classification of Gulf Brook Road is to establish a snowmobile connector trail with Boreas Road, back to the Tahawus Club and onward to Newcomb. Unless there's another route in mind. I hope to find out more next week. Gotcha... tired. Blue Ridge Rd is the highway. Yeah, I get the same feeling. In one aspect, it's much easier and less intrusive to use an existing road for snowmobiles and much less impact to build a hiking trail. Actually, a lot of the bike trails in Rochester are gravel or paved. I don't think they all fall within the GROC's purview. I live here, so I would know. And even looking at GROC's website, many of those trails have wooden paths built or show volunteers actively maintaining the dirt portions...this goes along with what I was saying earlier. If you want to have fun in the ADK's or NY, there is no lack of areas to explore. 'trail' as most people think of when discussing mountain bike riding is different than canal path, multi use trail, etc. - think hiking trail, but for mountain bike - and that means everything from gnarly rocky rooty portions (like some of the hiking down in Hi-Tor) or more like forest roads, double track, and buffed out single track... some smooth walking (and skiing) in Harriet Hollister, and elsewhere. there is no 1 size fits all. yes, 'trails' require maintenance - regardless of foot of bike. regardless of single track or double track. Hi again Bounder, you said lots of things I didn't think you had any knowledge to back it up and I never said trails don't need to be built and maintained. The better they are built, the better they hold up though. Rochester trails are perhaps a bit different than what might be built in the Adirondacks for bikes because there is less available land and a large number of users. Some trails are also very bike specific (a number of wooden features for bikers only) whereas others are very natural and look not different than a hiking trail to the untrained eye. The difference is the well built trails will almost never flood and will endure the tread of a bike tire much better than a blazed hiking trail that has no thought behind it. Gravel roads and old forest roads can sometimes be a good fit for bikes provided they drain well. Some I can think of that are hiking trails now are absolutely horrendous mud pits and see nothing but foot traffic. They continue to widen and get deeper because of hiking use. These are examples of poorly built roads and would never be good for bike use, and frankly should be shut down to foot use and rerouted (some have been in sections). You probably also missed my link to the IMBA proposal to the DEC for bike trails in Moose River Plain WF so I'll put the whole thread back up again. IMBA is a very large organization with a number of chapters that seek advocacy for biking. There are also organizations for skiing and such. What I find odd is how these organizations who want very little seem to gain almost no traction whereas snow machines get some kind of priority or consideration in almost every land designation. Even Wilderness there is always a consideration where the snowmobiles will go. I hope to find out more next week. Look for the UMP process to take place in early March. Likely only one meeting, location not known yet. Otherwise, not much was offered in terms of what to expect other than that it will come out in the UMP process. Would you mind posting the meeting location when you find out about it? Absolutely, there should be a press release very soon. Thanks for the update Uncle Buck. I wonder if they purposely plan these public meetings in Newcomb for mid week, and then announce it only one week in advance. I guess I have no choice but to submit written comments once again. They worked so well last time.